I’d like to take a little aside here to participate in a cool meme that has been bouncing around the travel-blog web as of late. The T-List was started by Mathiu of Radar, and here at Argentina’s Travel, we decided to give it a little facelift. The basic idea is to showcase cool travel blogs and give everyone in the travelogosphere (yup, I just made that up) more exposure and links. You simply add your favorite travel related blogs to the top, remove yourself, and pass it on. I was tagged by Tony of ‘de Viaje a Brasil,’ so his is the first blog that I’m adding back to the list! Also, I want to showcase the Argentine blogosphere a little here, so I’m adding Alan’s Buenos Aires Guide, Buenos Aires Daily, Buenos Aires through my eyes, and line of sight. Finally, I’m sending a shoutout to Chileno, and adding one of the coolest travelogues out there, The Lost Girls. As for the face lift, I’ve put the T-List in a table, and added columns for Author, Language, Category, and a Short Description. I’ve also made it downloadable, so that it’s easy to copy and expand. Also, feel free to grab the logo! I gotta say, I got to read a lot of cool blogs while putting this together, so only start exploring if you have a few hours to spare! 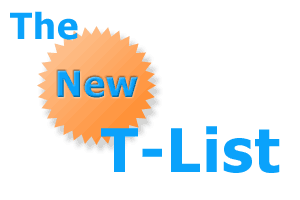 Alright, here is the new T-list! Since it doesn’t display quite right in our narrow blog, you can open the T-list in a new window. Buenos Aires Argentina Guide Alan Patrick English Buenos Aires Travel Reviews of all things Buenos Aires City. Buenos Aires Daily Karine English Buenos Aires Photoblog Great daily photos and commentary from a French woman living in BA. Buenos Aires through my Eyes Diva English Buenos Aires Funny and pointed commentary on BA from a student & tour guide. Chileno Chileno English Chile Travel Life in Santiago, Travel in Chile. de viaje a Brasil Tony Spanish Brazil Travel Brazil Travel info for Spanish speakers, written from Sao Paulo. line of sight Robert Wright English Buenos Aires Sights Smart commentary and photos from a tour guide & travel writer in BA. The Lost Girls Jen, Amanda & Holly English Travelogue 3 girls in their 20s ditch NY jobs for a 1-year journey around the world. Aquela Passagem Rodrigo Portuguese Brazil Airline Tickets Info about airfares and airline tickets in Brazil. Brave New Traveller (team) English World Travel News, reviews, and opinions for the savvy online explorer. Locura Viajes (team) Spanish World Travel Adventures, stories, and advice on travel by travelers. Notas do Turismo Jackson Lima Portuguese Southern Brazil Brazilian tourism southwest of the Parana. Pasa en Buenos Aires (gov) Spanish Buenos Aires News Hip blog maintained by the BA city government. Blog de Gestion Turistica Juan J. Lopez Sobejano Spanish General Travel Blog on tourism, travel, and more. Diario del Viajero (team) Spanish World Travel A blog dedicated to the art of travel, advice, lodgings, etc. En Transicion Mireia Spanish Travelogue The musings of a female traveler, now in Spain. Explorando Peru Rolly Valdivia Chavez Spanish Peru Travel Reports, stories, and photos from a journalist explorer. Primera Clase Antonio Spanish Tourism, Hotels, Flights News, reviews, tips, and travel info. Voy de Viaje Eva Paris Spanish Travelogue Cities, corners, tips, advice, memories.. all on travel. Zu Hause Gabriel S. Balirac Spanish Europe Travel Free time, places, on the road, travels. Buenos Aires, City of Faded Elegance Jeff Barry English Buenos Aires Culture Cultural, historical, and social issues revolving around BA. Rolling Rains Scott Rains English Travel & Disability Precipitating dialogue on Travel, disability, and universal design. The Travel Cooler Anni Poulsen English World Travel Travel articles and photos from around the world. Tim Leffel’s Cheapest Destinations Tim Leffel English Bargain Travel Bargain destinations, vacation values, and international adventures. Travel and Web 2.0 Joe Buhler English Travel Marketing Marketing in the age of customer control. Web 2.0 Travel Tools Alan A. Lew English Online Travel Tools List and info on web 2.0 sites related to travel and tourism. WorldHum (team) English World Travel Travel dispaches from a shrinking planet. Les Explorers Claude Benard French Online Travel Discover e-tourism and understand the travel industry. Chrispitality Media Blog Chris Clarke English Hotel Industry Marketing Part education, part entertainment, all hospitality. A Luxury Travel Blog Dr. Paul Johnson English Luxury Travel Focuses on the finer aspects of travel for the discerning traveller. Travel Rants Darren Cronian English Travel Industry Travel reviews, news, tips, and consumer info. Travolution Blog Travolution Blogger English Online Travel Commentary and analysis on the online travel industry. BootBlog Jessie English Travel Site Blog Behind the scenes blog for the BootsnAll travel network. Erin Julian Erin Julian English Travel Industry News, advice, top 10 lists, and photos from an industry insider. Happy Hotelier gje English Hotel Blog The happier the Hotelier, the happier the guest. Hello I m Paul Matzakaki from Tip 4 Travel and I like what you have started to do with the T list by giving some order and explanation on it. This page rendered in 0.732 seconds.